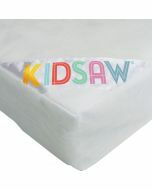 The Kidsaw Kudl Cotbed in white is the ideal product for your baby. It can be used as a cot at first and then, as your child grows, you can transform the cot in to a toddler bed. The edges provided feature bite guards and the middle 3 sticks can be removed. 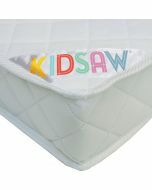 The Kidsaw Kudl Cotbed in white is the ideal product for your baby. It can be used as a cot at first and then, as your child grows, you can transform the cot in to a toddler / youth bed for a child up to 7 years. 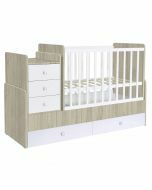 The top edges provide bite guards and the middle 3 sticks can be removed if your child is big enough to leave the cot by his or herself. The cotbed conforms to European standards DIN EN 716: 1 and thus meets the demanding requirements for baby and child safety. Suitable from birth until your child is 7 years old. 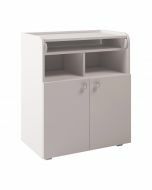 Features 2 base heights and 2 PVC protective rails. 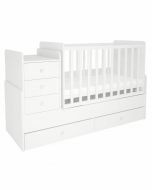 Mattress not included, it takes any toddler mattress of dimensions W.70 x D.140cm. Note: The bed is supplied un-assembled and with installation instructions. The fabric sky and bed linen are sold separately.